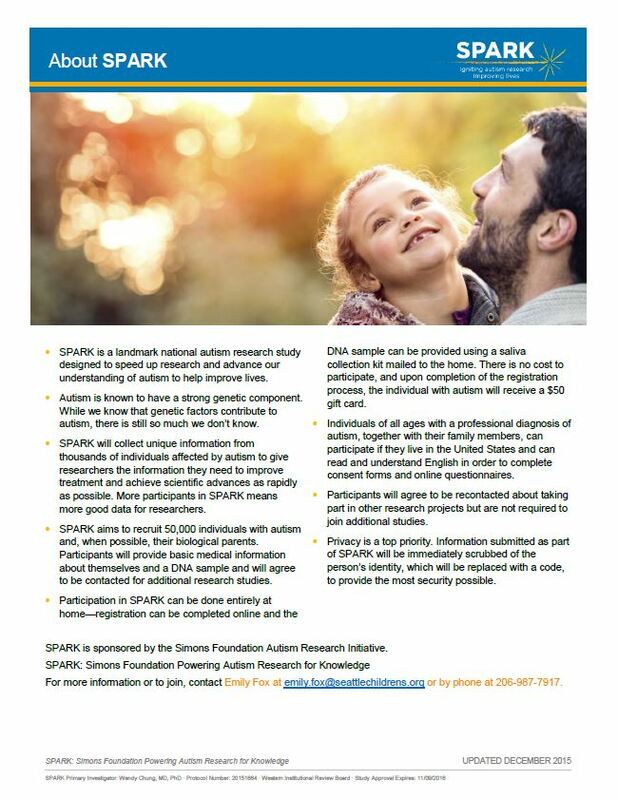 The goal of the SPARK project (www.SPARKforAutism.org/UW) is to collect genetic information on 50,000 individuals across the country with ASD and their families. Anyone with a diagnosis of autism can participate! Participation includes online registration, consenting to be contacted about future research studies, and the delivery of a saliva sample. These samples will be analyzed for ASD-related genetic differences. Families may choose to have their genetic testing results sent to a medical provider of their choice, should a genetic difference related to ASD be found. If you are interested, please contact Theo Ho, the study coordinator, by email (scacstudies@seattlechildrens.org) or by phone (207-987-7917).